There is always a first time they say; and you never forget the first. So, it came to pass. 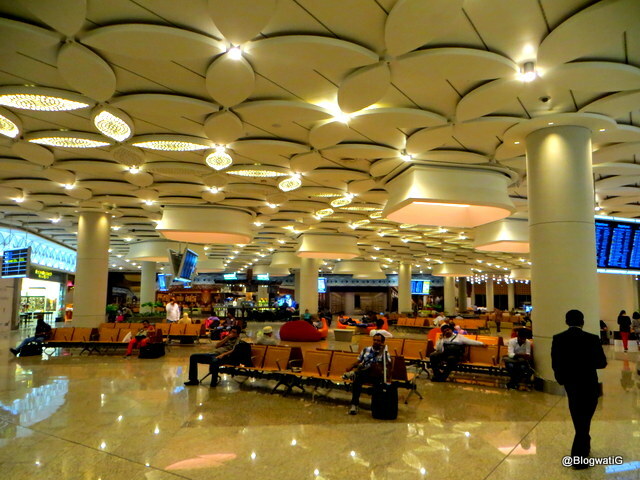 Last evening, I made my way to the much talked about Terminal 2 at the Mumbai International Airport. The T2 IS an absolute delight. The architecture, and the artistic rendering do bring a smile on your face. I truly felt, we had arrived, finally. Yes, it was heavenly indeed. Ah, but the Immigration brought me back to earth! The serpentine lines and total chaos is not what we need after such a revamp. I don’t understand why can’t we have young, customer friendly and EFFICIENT counter staff that greets visitors? No matter how much moolah you spend on the infrastructure, if you don’t have a staff that complements it, it negates everything. Well, after an hour in the queues, and not much time to explore the airport, I was quite disappointed. I was hoping my first flight with Etihad Airways to Abu Dhabi would be uneventful. The boarding, pretty much on schedule, was announced. And it was done sequentially, starting with the tail end of the flight. As a result, we got onto the aircraft without a fuss. We had enough room to enter without bumping into co-passengers. And frankly, it only made sense rather than ‘sections’ of people allowed to board first. I was a tad bit at ease. No one can make Economy seats look good, so I guess not much to be said there. But the staff were friendly, the pilot was seasoned and the flight was on time. We had this particular air hostess who seemed exceptional with the kids. She made sure they were comfortable and seemed to manage excellent conversation with her young patrons. I later got to know she belonged to the ‘Flying Nanny’ tribe. A facility initiated by Etihad, where the core duties include managing young passengers and their needs. A first of sorts in the aviation industry I guess. And as I write this, I believe Etihad Airways have very recently added Jaipur on the list of their destinations. And in keeping with tradition, the flight was greeted by a water rainbow with a two fire engines, one on either side. Yes, first times are special indeed. And these experiences are what become memories over a period of time. Dee is a friend I made at the last A to Z challenge. I missed meeting her last year when I travelled to Singapore. But some day, I will. She tells her stories as an ex-pat in S’pore. Do read. Anuradha is a funny gal. She can get your knickers in a twist.Don’t believe me? Find out for yourself! Hope to check out the new airport myself soon. I have heard a lot about the museum section there.